A couple of days ago, Everdisplay disclosed its first major design win with a "top enterprise storage vendor" for its 40nm 256Mb STT-MRAM chips. We now know that this vendor is IBM - as it introduced its latest-generation enterprise SSD FlashSystem, which indeed includes Everspin's STT-MRAM. Using MRAM instead of DRAM memory enabled IBM to remove the relatively large supercapacitors (used to make the DRAM non-volatile) and so the company was able to reduced the size of its drives and switch to a standard 2.5-inch U.2 drive form factor. The new FlashSystem SSDs support up to 19.2TB of 64L 3D TLC NAND. 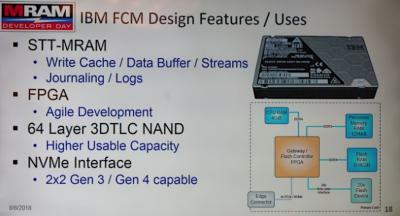 IBM's system uses a 20-channel NAND interface and a four-lane PCIe 4.0 host interface that can operate in dual-port 2+2 mode. IBM will start shipping these new drivers by the end of this month.